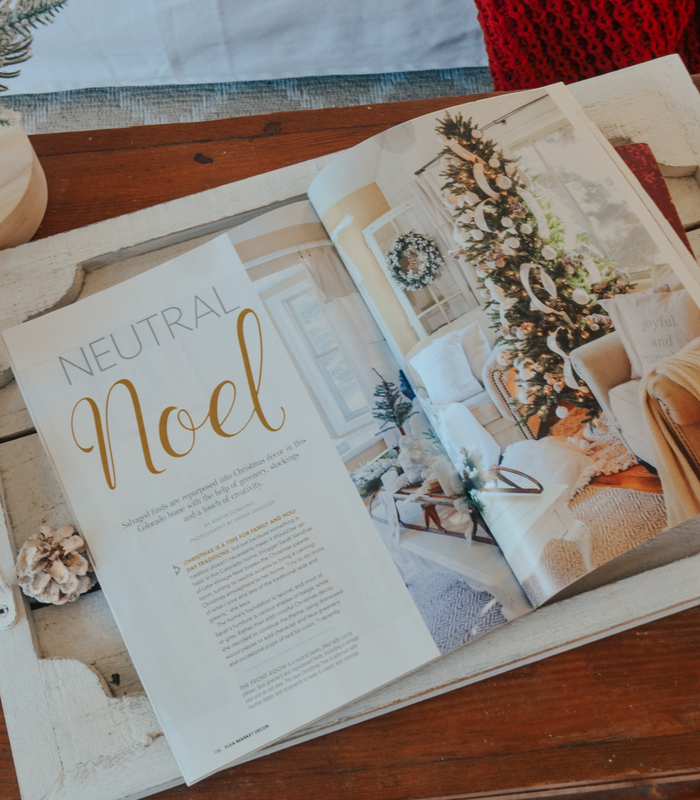 Today I wanted to pop in real quick to share an exciting moment with you guys because our home was recently featured in the holiday edition of Flea Market Decor magazine!! It’s actually a seven page spread and an interview, which is pretty darn exciting for this small town girl. I wasn’t really planning on even mentioning it here, because it honestly feels awkward to talk about things like this, but I wanted to celebrate this moment with all of you who have supported me for so long. Things like this always make me reflect on my journey. And I’m actually coming up on the three year blogging anniversary. It was Black Friday three years when I finally took the plunge and decided to start blogging. I published my first posts in December of 2015. And even though I had absolutely no idea what I was doing, I was so excited to start something new and share my passion for home in my little corner of the internet. Since then this blog has grown beyond anything I ever could have imagined. It’s been a labor of love and I’ve poured my heart, energy, and soul into this space in more ways than I could ever explain. And through it all, God has been so good to me. He’s blessed me beyond measure and I’ll always give Him the glory for any success or good fortune that comes my way. It’s hard to describe how much it means to me when a magazine finds my work worthy of being in print. It’s a lot to put yourself out there on a daily basis–your home, your ideas, your projects, etc. It’s scary at times and to be completely honest, I’ve wondered on many occasions over this past year if it’s all worth it. I’ve had moments of burn out, times of struggle, and times of just feeling spread way too thin. So much time and effort goes into this space and I always pray for God to show me His purpose in all of this. And just when my heart really needs a boost, or a sign to show me that I’m doing good work, He always delivers. This magazine feature is an example of that and I am SO grateful. 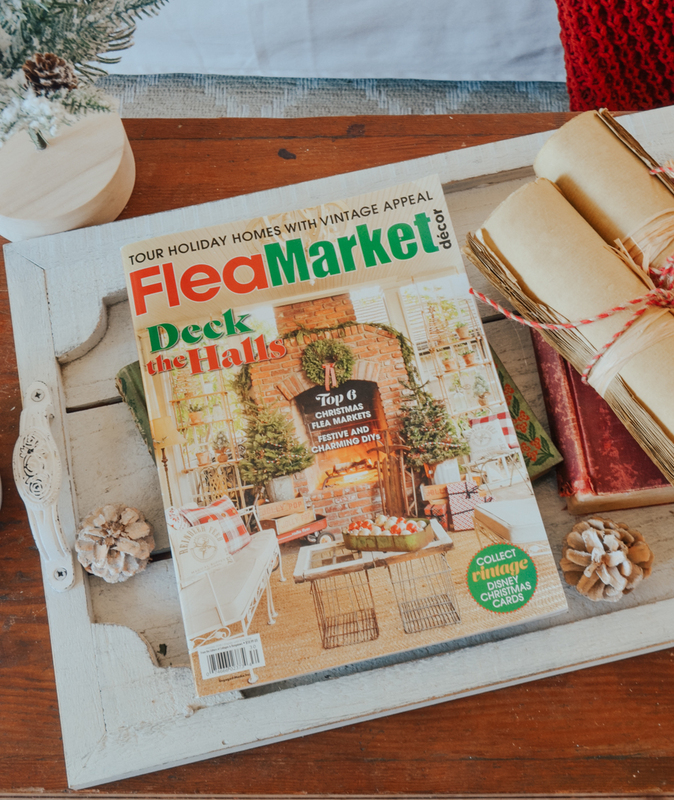 PS: the holiday edition of Flea Market Decor is on stands now. You can find it anywhere magazines are sold! Congratulations! You’ve created a home that is warm and inviting. Thank you for allowing us all to be part of it with you. I am an avid DIY crafter too and flea markets are my favorite stores to find one-of-a-kind pieces to make our home comfortable. I also love creating our own unique pieces to complement the spaces. Enjoy your success! How exciting for you and your family!!! You deserve all the kudos and blessings! Congratulations, getting the magazine today! Sarah! You deserve it! Your home and your creative style is just so warm and welcoming and I LOVE it! 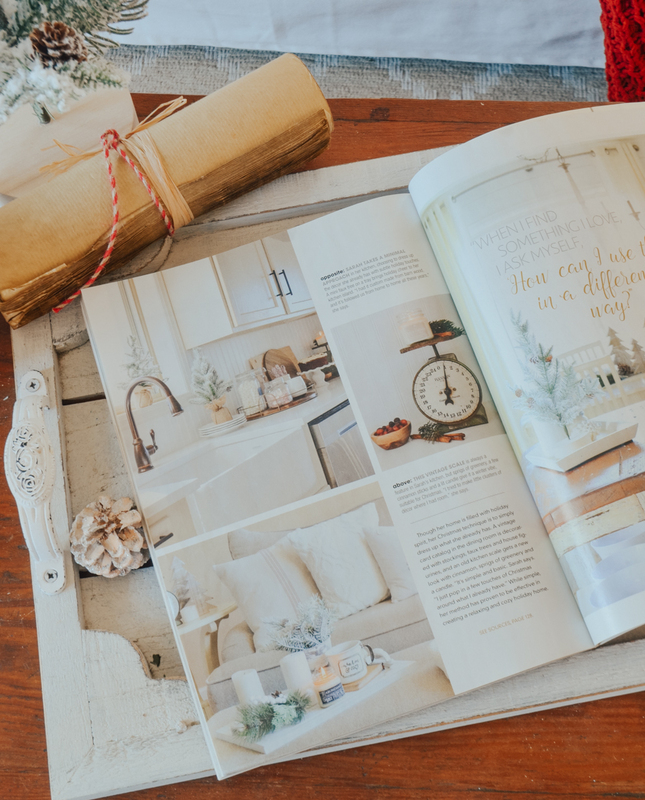 The whole world will LOVE it to when they see your home revealed in the pages of this magazine. Keep up the great work! I so enjoy your blog! Congratulations. Thank you for sharing your home and all your amazing ideas with us all. You make everything seem easy enough for us all to try and do. Your home is beautiful…..
Congratulations Sarah! You have shared your passion for home decor with us and given us so much inspiration! Can’t wait to see the magazine! Ohmygosh Sarah!! Congratulations!! ❤️ How awesome for you! Big congrats, Miss Sarah!! You deserve all the success that comes your way, not only because of the hard work you put in, but also because of your shining example…gratitude to the Lord and to your loyal followers and the priority you place on your sweet family…you’re the real deal!! WOW..WOWIE, Congratulations. What a honor. I will have to look for a copy. Your home looks so warm and inviting…Keep up the great work. I am so happy for you, Sarah! You deserve this. I love not just your amazing decorating style, but your genuine warmth, and your love of God and family. You have certainly inspired me in many ways. Keep up the excellent work! Congratulations!! So very happy for you! Well deserved for sure. Your home is beautiful and an inspiration to many of us. Will have to run out and get my copy! Congratulations Sarah. I can’t wait to get one. It’s pretty obvious how much you put into the blog, IG, all the media. You deserve the recognition. Big hug 🤗 from me! You are so deserving of this layout and interview. You are a phenomenal decorator. I need a copy of this magazine. I need a subscription to this magazins. Will take care of that today. Congratulations. Your home is so beautiful, I plan to try and do some of those things in my new/old little country homw. That is SO exciting Sarah!! I’m so happy for you and this accomplishment. Glad you shared because this gives each of us even more inspiration and motivation ☺️ Plus it’s most definitely celebration-worthy! Congratulations Sarah! That is so cool! Thanks so much for sharing your home and life with us! Congratulations on the magazine article—now I know someone famous 😊. I love your style. Can’t wait to get the magazine! Congrats on your hard work and I love your style! Congratulations Sarah! You definitely deserve it! Oh Sarah, so thrilled for you, it was so much fun seeing all the transformations from when you moved into the house until we moved from the neighborhood. Enjoy the holidays with your wonderful family! God is Good and certainly blessed you and your family. But God gave you a special gift and you were brave enough to use it like he wanted you too. Look where it has taken you!! Thank you for being you! Congratulations. How proud you must be to see the fruits of your labor and love reach this achievement. Sarah, I am so happy for you. Because you have put your heart and soul into this, you should be so proud to reap the rewards. God always blesses those who walk in His ways. Congratulations !! I look forward to seeing your posts through the week. I also enjoy your sense of humor and self proclaim “goober-ness” lol. I pray God will continue to guide and Bless you and your family. Congratulations, Sarah, so happy for you! You’re home is beautiful and cozy and I really enjoy readIng your blog posts. I haven’t bought a magazine in years, but may just have to check this one out! Congratulations! How exciting and what a compliment to you to be featured!! I’m not surprised at all because what you do is always amazing! I’m going to be on the lookout for the magazine! Yay for you!!!! And so now I’m off to buy a magazine. Love seeing your hard work pay off like this. These magazine folks are on to something – your style rocks!! Thank you for sharing it with all of us! 7 PAGES!! Holy cats! That is simply amazing, but not at all surprising! Your work speaks for itself! I’m finally feeling like I can make our house a home even with our minimal to nothing budget and simple decor items! I have just started reading and loving your blog!! Don’t give up, you are a natural talent my dear. I LOVE how you decorated for the Holidays, very peaceful. I, too, did a neutral theme this year and am loving it. May God continue to bless you. Well done Sarah, your home reflects comfort and all those lovely pieces that showcase your talent. It is a big deal to be featured in this magazine! Omg sarah, congratulations! That is super exciting for you!! You’ve worked hard and deserve this! Sarah I don’t comment often but I look forward to your daily posts! You’re home is so beautiful and I’m so happy for you being featured in Flea Market Decor. That is a wonderful blessing! Have a blessed holiday and new year! Congratulations. I don’t ever recall seeing that fireplace in your home. I must not be paying attention! Congratulations!!! Be proud of your accomplishments!! You have done a great job and have inspired a ton of people! How wonderful for you! I have just recently run on to your blog and I love it!!! I love all of your ideas and your style! You are an inspiration! Keep going! Oh my goodness Lisa, you have touched my heart with your comment. Thank you so much for sharing that verse, I absolutely LOVE it. What a powerful message! I’m so grateful you took the time to share that. I am writing that verse down!! Hi there…sending love from London, I’ll be in New York this weekend (talking at a conference) so will make sure to grab a copy !! oh awesome, thank you so much Janice. Good luck at your conference! I am so happy for you!!! You have an amazing talent for design and put the hardwork in it to make an amazingly, beautiful home for your family!! I look forward to your blog and yes, I do steal some of your ideas. Am headed out today to purchase the magazine. Hope your family has a lovely, wonderful, sick-free Christmas!!!! haha steal away Jeannie! That’s why I share–so you can use the ideas in your home too if you like. And thank you for the well wishes, I’m hoping we have a sick-free Christmas too!! I am so happy for you!! You have an amazing gift for decorating and hard work that truly makes a house a home!! I must admit that I do occasionally steal ideas from you! I love your blog and you are greatly appreciated for sharing your love for God and family, especially when things are not going so perfectly. It is important that people see your perfect home and family and know that you have some struggles like the rest of us. We are all here to support one another!! Thank you so much for this blog! haha thank you so much Sherry! Oh I’m so glad you did Jeannine!! Thank you!! Sarah girl! You are such a dear! I am so thrilled for you! I can’t even imagine how exciting to have your beautiful work in print! I know God will continue to bless you sweetie as you give him all the glory!!! You definitely have the Midas touch hun!!! So so deserving! I can’t wait to pick up my copy!!!! YAY! Thank you sweet Dena!! You are such a kind soul and I’m so grateful for our friendship!! Congratulations! How exciting! Thank you for inspiring all of us to create our own special place in our home that makes us feel happy….gives us that warm and cozy feeling and just puts a smile on our face! We love your ideas for re-purposing things we already have and links to those new things that we can’t live without. Over the Thanksgiving holiday I painted 4 pieces of furniture I wasn’t that crazy about anymore….now I love them and they have just the look I wanted! Keep up the good work! Oh that’s so awesome Teresa!! I love painting furniture, it’s like a whole new piece of furniture for very little money. So glad you like how yours turned out and just in time for the holidays too! Congratulations!!!!! I’m not familiar with the mag but I’ll be checking it out now!!!! You were chosen because you put “Yourself” in everything you do. You share all your knowledge about decorating/life with all of us and we appreciate that so much. Praise God what a beautiful Blessing! Just to let you know I am so pleased for you, that you have been featured in an interiors magazine. I always look forward to your lovely blog postings each time they arrive in my inbox. As a UK fan may I just wish you continued Blessings for you and your family. Sarah, I can’t wait to get that magazine and see your article! How amazing is that! You are so deserving to have your home featured. Don’t ever hesitate to mention that kind of thing. All of us that follow your blog get really excited when something like that comes your way because you so deserve it. Thanks for sharing! thank you Deedra! I am so grateful for that and I can’t even tell you how much I appreciate your support!! I agree Gayle, God has blessed me richly to be able to share my passion in this little space. I am so grateful!! And thankful for your support and kindness too–thank you!! I love your style and down to earth approach. I especially love that you give God the glory for all you have and do. Thank you and I look forward to learning from you! Thank you Jessica!! I’d certainly be nothing without Him. Congrats! You have a beautiful home and are so sweet. You deserve all the recognition. Yours is the only blog I’ve ever followed and it has been a fun few months. I also feel spread way too thin but I give myself a break to read your blog and look at your adorable home. Love your ideas! Great job and Happy Holidays! Congratulations Sarah!! This is an awesome accomplishment for someone very deserving! You’ve done an amazing job with your Blog and it’s good to know that hard work and something that brings joy to so many is being recognized. Blessing to you and your family. I am from South Africa and I started to follow you on instragram. I usually cant wait for your stories. Congratulations! Many blessings to you and your family. Im looking forward to getting the Flea Market Decor Magazine and checking out your spread. Enjoy! Omg!! That’s so exciting and amazing to get in a magazine.. great job 🙌you deserve it. Can’t wait to pick one up. I am from Malta can i find to buy the magazine in here . Oh hi Maria!! I don’t think it’s sold in Malta, unfortunately. 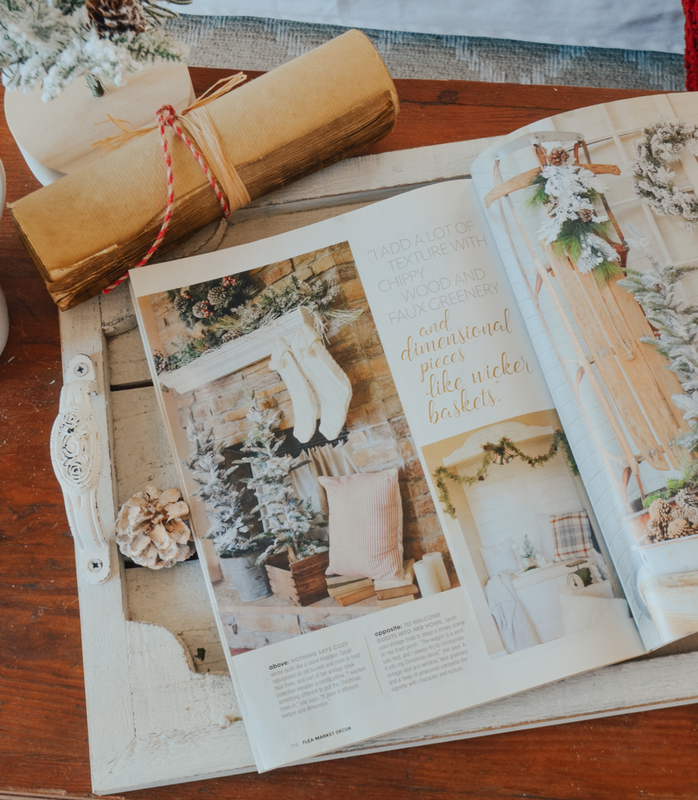 Your home is always so beautiful Sarah & not just at Christmas..It deserves to be in a magazine! Congratulations! ah thank you Sherri, I always appreciate your kindness!! 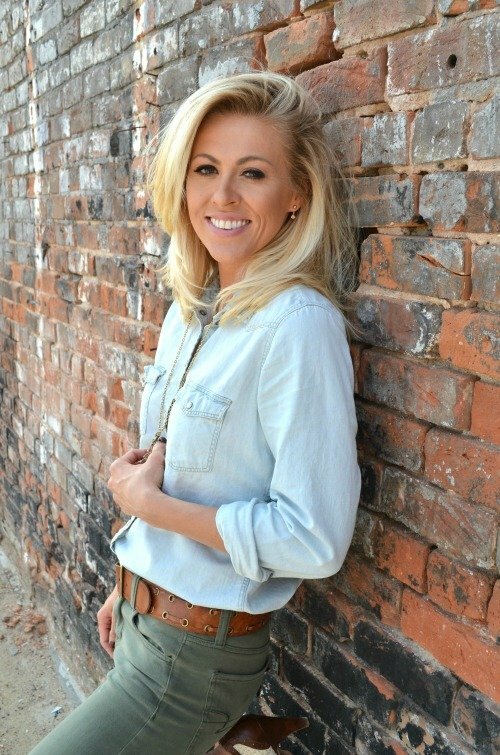 Congratulations on being featured in the Flea Market magazine! It’s obvious that you work very hard at making your home comfortable and inviting (and so stinking cute). Many would pat themselves on the back at this point and say that they did it by their own power, but you are giving the glory to the Lord who has blessed you with a wonderful gift : ) May He continue to bless you! Thank you Teresa! I certainly can’t take much credit for any of this–God has been in control the entire time. Congrats!!! That is sooo cool!!! Sarah, this is SO cool!! You better never NOT share this kind of thing! haha What an honor, and a well-deserved one at that. So happy I stumbled across your site. Keep up the amazing design work!! Bought my copy today. Can’t wait to read it! Love your posts, especially of those babies! So much love!